As you may recall we began our work exchange at the home farm of our hosts, Ev and Claudia. 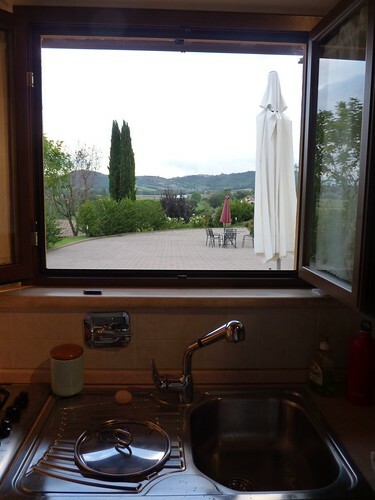 We tended grapes, did a bunch of gardening and weeding, took care of the chickens, ate a lot of figs and enjoyed the quite life of rural Umbria. Before we arrived, we knew that there two other volunteers who had made arrangements to be at Ev and Claudia’s during the wine harvest so we had some overlap. And since we wanted to stay longer than these other volunteers they offered to let us stay at Claudia’s bed and breakfast near Perugia, Il Casale della Staffa, in exchange for sanding and re-staining all the windows and me finishing the website. So for the last 2 weeks we’ve been living in one of the apartments at the B&B, working in the morning, sunning by the pool midday and then visiting the beautiful towns and villages of Umbria in the afternoons. I won’t lie, it’s been pretty great. Being in Italy is like being on a never-ending honeymoon for us. Everything is beautiful, delicious, romantic and even if the work isn’t too exciting, how could one possibly complain when you have this view out your kitchen window??? It seems that there’s always some kind of festival or event going on here. Maybe that’s because it’s harvest season, but we’ve been really fortunate that there’s a festival going on all the time – I’m serious – music, arts, food, wine and soon to be chocolate. There’s a lot happening in Umbria apparently. Jon is going to write about the incredible Montefalco Wine Festival that we went to so I won’t steal his thunder there. I will say that Montefalco – also called the banister of Umbria – is a delightful little hill town. If you like wine, this is the place to go in Umbria. It’s known for its Sagrantino, a grape that only grows in this region of the world. That in addition to the other “typical” products of honey, truffles and cured meats makes for Montefalco to be a delicious place to be, both for the eyes and the senses. We also had the opportunity to visit Assisi – the namesake for Francis d’Assisi or Saint Francis (hello San Francisco). Despite the fact that Saint Francis was practically a hermit and lived in nature, trying to be a very humble figure within the grandure of the Catholic Church, Assisi is an impressive town with an even more impressive Cathedral built in Saint Francis’ name. We saw it first from the road at night, and then up close during a visit with our fellow helpers. The climb up to the historical center is not only a good workout but also a beautiful introduction to this holy city. Signs of devotion are everywhere. Making one’s way down the main road you pass a Roman temple from the 1st century BC, which became one of Saint Francis’ churches. I loved being able to clear see the Roman qualities to this temple, and then the medieval addition that is the church. It’s such a great example of how these ancient sites have developed over time. Another thing that caught my eye was the banner hanging from the church depicting a visit by the Pope, Francis, to Assisi on October 4th. Have you ever met a Jew who’s this excited to see the Pope? Probably not – I mean, come on, he’s pretty hip you have to admit. St. Francis’ cathedral is really stunning, and I love that all the paintings and frescos (by Torriti, Cimabau and Giotto on the upper level and by Lorenzetti, Giotto and Martini in the lower basilica) inside tell the story of his life and deeds –something rare for churches at the time. This is a place of pilgrimage for many Catholics. Despite that, I still didn’t feel pulled in by a spiritual magnet to this place, until we went below to visit St. Francis’ tomb. A quiet, simple, modest room, candlelit, with St Francis resting in the very stone column that runs the entire height of the cathedral – not only is this structurally important – it’s symbolically perfect – he’s holding this place together. I was really moved by that place, in the midst of all the art and magnanimity of the churches and the age and beauty of the towns we’ve seen – the tomb of St Francis is something I will never forget. I also won’t forget the truffle/lardo/salami sandwhich we got right on the main drag in Assisi – surrounded by touristy places it was a slim chance we’d get good food. But that was a spiritual experience in and of itself. This arrangement has clearly been pretty great. It’s allowed us time to intimately get to know the region of Umbria, and our hosts are accomplishing tasks they haven’t been able to. This week is what we’ve been waiting for: grape harvest. We’ll head over to the house early in the morning on Wednesday and hand-pick the grapes. They’ll be taken up to the ‘cantina’ - not a bar – but the place where the wine is made. The cantina is a small room in a 15th century church by the way that’s up the road from the house. Our first day’s work in Italy involved painting it and cleaning the floor in preparation for wine making. It’ll be wonderful to actually mash the grapes, and see the whole process from start to finish – actually building the cellar, to tending the vines, picking the grapes and making the wine. Umbria is really beautiful and if you ever get a chance to come here, I can’t recommend it enough. We’ve visiting Corciano, Orvieto, Todi, Betona, Montecastello di Vibio, Castiglione del Lago, Passignano, Marsciano, Foligno, Montefalco, Assisi and driven through countless hamlets and villages which all have their own charm. What’s amazing about these towns is that they all feel different and have their own traditions. They’ve all survived hundreds of years of turmoil and wars being propped up on their hills. Pretty smart if you ask me. We still have the big Tuscan cities on our list: Siena, Arezzo and of course Florence. I can’t say it enough how grateful I am for this arrangement. A few hours of work a day is a small exchange to live here for 2 months, practically for free.